A plump finch with a thick, cone-shaped bill. Males have a brilliant, golden yellow body with dark grey head. Gold band is seen across forehead. Tail and wing feathers are black. A white patch is also on the upper wing. Females have a more subdued appearance. Body is silver-grey with patches of yellow on the side and rump. Distinct white patches can be found on the wing and underside of the rump. Most commonly heard using a wide repertoire of calls, cries, and whistles. Feeds on seeds from spruce, balsam fir, and pine cones; will also be seen eating small fruits such as cerries, crab apples, and juniper berries. Also feeds on invertebrates such as larvae, caterpillars and aphids. Has a close predator-prey relationship with the spruce budworm, a forest pest. Can be seen on roadways in the winter eating raw salt and fine gravel off of the roads. 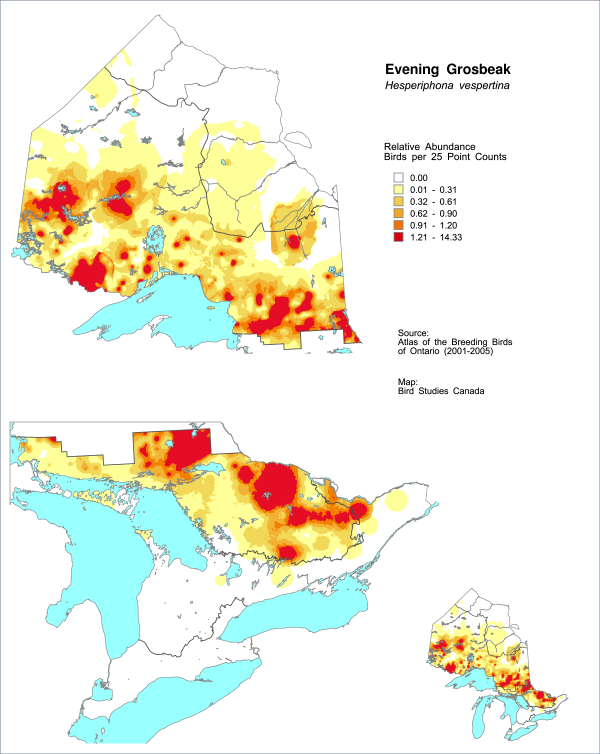 Breeding occurs mainly in the boreal forest, and can often be seen in central Ontario during the winter. Nests are built in tall spruce or deciduous trees. Females will lay three – four greenish eggs that are lightly splotched with brown. Prefers mature conifer forests but can also be found in mixed deciduous forests. Found during the breeding season in the boreal forest. When cone crops are poor in northern forests, they will often spend their winter south of their normal range. They can be seen at bird feeders during these years. 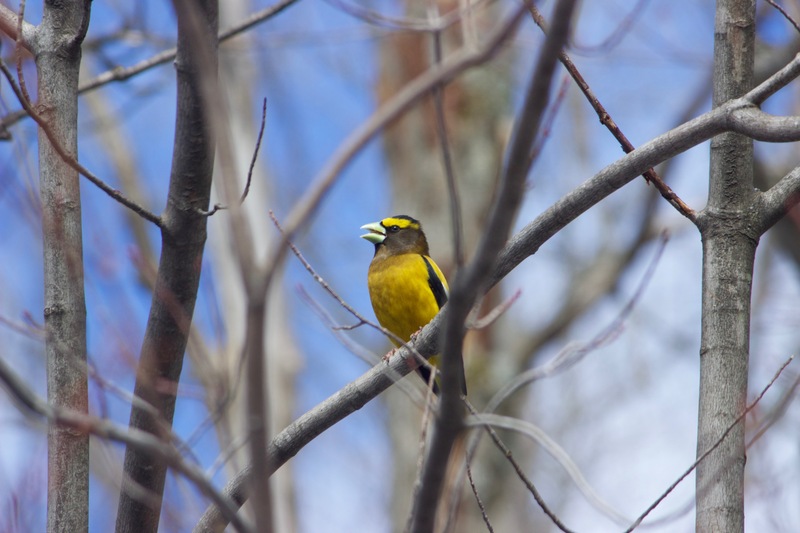 Evening grosbeaks are among the 10 species in North America most frequently killed by window strikes, especially near bird feeders. It is important to properly place bird feeders in locations that does not pose threats to visiting birds. Click here for more information on bird feeder placement. 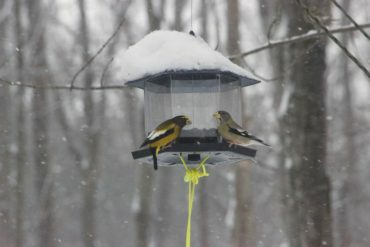 Collisions with vehicles is a threat during winter when evening grosbeaks are often found on roadways feeding on salt. 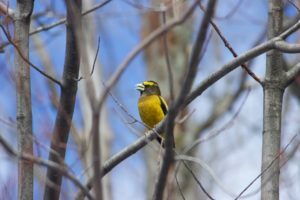 Currently there is a lack of studies investigating the response of evening grosbeaks to forestry practices and it is unknown to what extent different forestry practices may impact their habitat.